2. A little history from my history teacher older brother in an email this morning: World War I ended with an Armistice on November 11, 1918, which went into effect at 11:00 am-the 11th hour on the 11th day of the 11th month of the year. Armistice Day is still observed on November 11 of each year, although it is now called Veterans Day in the United States and Remembrance Day in the Commonwealth of Nations and parts of Europe. 3. This brother ^ and I are 10.5 months apart. I think that’s pretty much as close as you can be without being twins? We are the same age for over a month of the year :) We have always been good friends. 6. I love garbage day. There is just something deeply satisfying watching your garbage/junk being taken away. 7. Doesn’t a room feel automatically cleaner if there are vacuum lines on the carpet? My sil Kristine always teased me that it looked like I mowed our old shag carpet in our apartment in Logan. 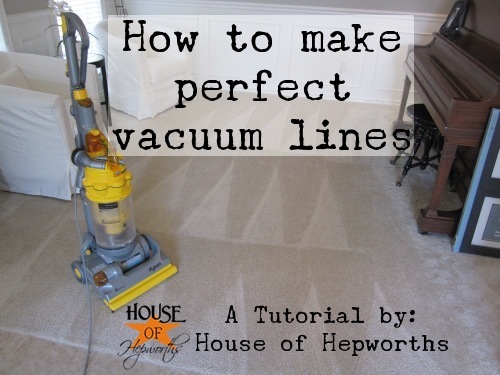 I love that Alison from House of Hepworth’s did a post how to make perfect vacuum lines! 9. Does it bother you when companies do this with their names? Karl’s Karz or Candy’s Cutz. I don’t know why it drives me crazy, but it does. 10. I made this 10 minute taco salad last week and my family loved it. I loved it because it was 10 minutes to make~it’s in our keeper file. I can’t believe I pulled out 11, but this date deserved a special post. My sister and I are 11 months apart :) we love being so close and it's fun to be the same age for a while every year! I got a kick out of the American girl doll comparison. My friend linked to your blog on facebook for this reason, lots of little girls wanting one and we were talking about which one to get. Thx for answering via a picture what we'll be doing! And yes, I feel the same way about garbage day and I LOVE that movie too. Whenever that annoying 1-877-Kars.4.Kids jingle comes on the radio, I HAVE to turn it off. Just 'cause of that I'll never donate to them!!! And ranking right up there is: How do you spell relief? R.O.L.A.I.D.S. My mom's neighbor's son actually put that down on his spelling test!!! Love this post! I just wanted to tell you how happy I am to have found your blog - I truly enjoy reading your posts and being inspired by your projects/photography. Great post Melissa! I wish I had seen that video yesterday. I spent most of the day thinking of what I could put on my blog but nothing seemed enough. So I remained silent. My best friend in high school (and still is) used to make lines in her carpet so she wouldn't have to vacuum every week. I would run through them and mess them up just to make her mad (-: And I hate it when companies do that to their names. My husband will purposely point them out so he can see my eyes roll. I loved your eleven comments about things. The doll hair picture is a classic!